Don’t you love your cereals or granola in the morning? Many people do, but are tempted by the rather unhealthy processed ones – they taste so great! However, it is so easy to make your own and maybe add all the things you love. All you need is 10 minutes of preparing and some patience. Give it a try because you just can’t beat freshly baked granola! 1. Preheat the oven to 175 degrees. Mix the maple syrup, oil, cinnamon and the salt together. 2. Mix the remaining ingredients in a large bowl. Add the oil mixture and mix well untill all ingredients are lightly coated. 3. Spread the mixture over a baking tray with baking paper. Gently press down the granola with a spoon to make sure the oats are pressed up against each other. Bake for 15-20 minutes in the oven. Stir at the half-way baking point and again press down the granola with a spoon. 4. Allow the granola to cool for another 30 minutes in the hot oven (switched off). Remove from the oven and leave to cool outside the oven for 30 minutes. 5. 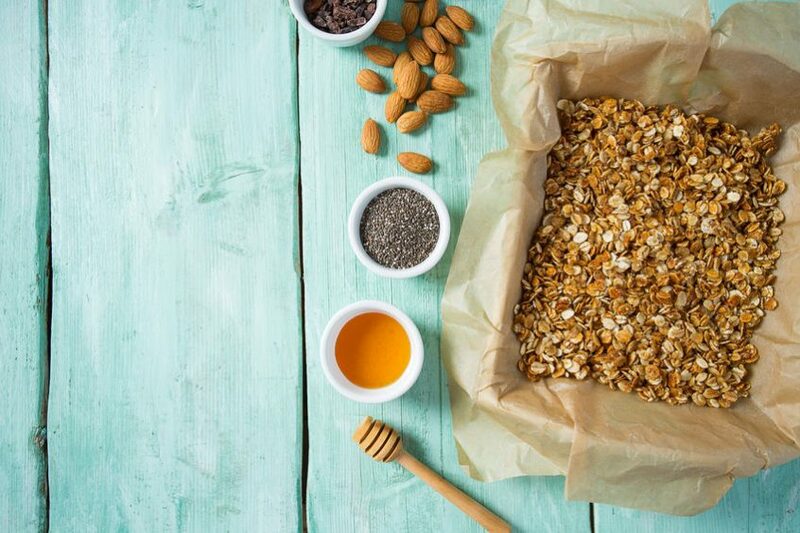 Store the granola in an airtight container at room temperature for 1 to 2 weeks. You can also seal it in a freezer bag and store it in the freezer up to 3 months. Optional mix-ins: Raw chocolate chips can be added, but only after the granola has completely cooled. You can also add coconut halfway through baking.